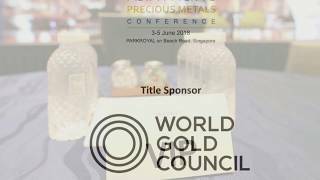 Singapore Bullion Market Association (SBMA) and Enterprise Singapore, as well as our sponsors and partners would like to thank precious metals industry participants for their wholehearted support and contributions to the success of the 2nd Asia Pacific Precious Metals Conference on 3-5 June 2018. The conference was attended by 358 delegates from 170+ companies in 29 countries. We look forward to welcoming all the delegates to the 3rd APPMC on 09-11 June 2019. Since Singapore lifted its Goods and Services Tax (GST) on Investment Precious Metals in 2012, SBMA has played an active role in raising the profile of Asian bullion markets internationally. SBMA strives to play a greater role in the region by bringing together ASEAN bullion markets through the sharing of knowledge and best practices, liaison with government agencies and stakeholders, and by connecting industry participants to global markets. The Asia Pacific Precious Metals Conference is one such platform through which SBMA and Enterprise Singapore hope to foster solidarity among bullion markets in Southeast Asia and beyond.